Audio is a managed service in iOS, tvOS, and watchOS. The system manages audio behavior at the app, inter-app, and device levels through the use of audio sessions. You use an audio session to communicate to the system how you intend to use audio in your app. 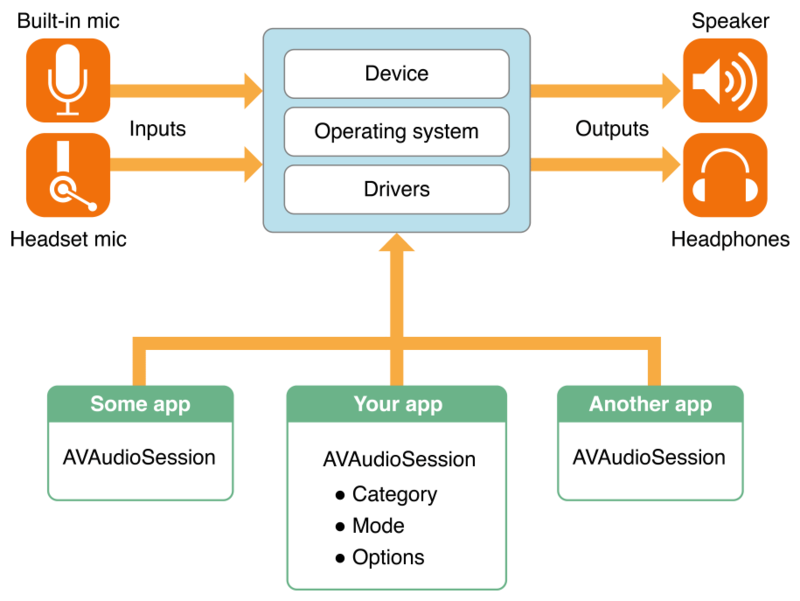 This audio session acts as an intermediary between your app and the operating system—and in turn, the underlying audio hardware. You use it to communicate to the operating system the nature of your app’s audio without detailing the specific behavior or required interactions with the audio hardware. Delegating the management of those details to the audio session ensures optimal management of the user’s audio experience. An audio session is the intermediary between your app and the operating system that is used to configure your app’s audio behavior. Upon launch, your app is automatically provided with a singleton audio session. You configure it to provide the desired behavior and activate it to put that behavior into action. Relevant Chapters: Activating an Audio Session. The primary mechanism for expressing audio behaviors is the audio session category. By setting the category, you indicate whether your app uses input or output routes, whether you want music to continue playing along with your audio, and so on. The behavior you specify should meet user expectations as described in Audio in iOS Human Interface Guidelines. AVFoundation defines a number of audio session categories, along with a set of override and modifier switches, that let you customize audio behavior according to your app’s personality or role. Various categories support playback, recording, and playback with recording. When the system knows your app’s audio role, it provides you appropriate access to hardware resources. The system also ensures that other audio on the device behaves in a way that works for your app and is consistent with user expectations. Some categories can further be customized by specifying a mode, which is used to specialize the behavior of a given category. For example, when an app uses Video Recording mode, the system might choose a different built-in microphone than it would choose if it were using the default mode. The system might also engage microphone signal processing that is tuned for video recording use cases. Relevant Chapters: Configuring an Audio Session. An audio interruption is the deactivation of your app’s audio session—which immediately stops your audio. Interruptions occur when a competing audio session from an app is activated and that session is not categorized by the system to mix with yours. Your app should respond to interruptions by saving state, updating the user interface, and so on. To be notified when audio interruptions begin and end, register to observe notifications of type AVAudioSessionInterruptionNotification. Relevant Chapters: Responding to Interruptions. Users have particular expectations when they initiate an audio route change by docking or undocking a device, or by plugging in or unplugging a headset. iOS Human Interface Guidelines describes these expectations and provides guidelines on how to meet them. Handle route changes by registering to observe notifications of type AVAudioSessionRouteChangeNotification. Relevant Chapters: Responding to Route Changes. Apps don’t have direct control over device hardware, but an audio session provides the interface for you to request your preferred hardware device settings. This interface enables you to perform advanced audio device configuration such as setting sample rate, I/O buffer duration, and number of audio channels. Relevant Chapters: Configuring Device Hardware. Apps that record audio, alone or in conjunction with video, require explicit user permission before recording is allowed. Until the user grants your app permission to record, the app can record only silence. AVAudioSession provides the interface to ask for this permission and determine the user’s privacy setting. Relevant Chapters: Protecting User Privacy. Be familiar with Cocoa Touch development as introduced in App Programming Guide for iOS and with the basics of Core Audio as described in that document and in Core Audio Overview. Because audio sessions bear on practical end-user scenarios, also be familiar with iOS devices and with iOS Human Interface Guidelines, especially the Audio section in iOS Human Interface Guidelines.